Well today an offer was made on the house and we have accepted. We are so pleased, as this is difficult times for everyone. We still have to sign contracts, but the couple who are buying can't wait so there shouldn't be any problems, as it is a very small chain. Fernwood were working fast to get one boat out of the workshop three weeks ago, and then it was all speed ahead to get the Whitefield boat (which was shown on Waterworld) out last week. But Derwent6 is still coming on very slowly.....not much has happened over the last three weeks as Fernwood have still been trying to get another boat out, and doing snagging on the ones which have gone out. The good news is that that boat is near completion, and for some, is that it has now made some space in the workshop, but there is alot of work to do for those who are waiting to get in the workshop. As for Derwent6 the waste tank had been put into place, but thats about it. As for us we have been busy. What with our Wedding Anniversary and planning our holiday and selling the house, let alone building a boat. And there we were, thinking we were going to have a nice quite Wedding Anniversary....Not! The plan was that we were going to be taken out for a nice meal with our friends, Rich and Lisa but on arriving at our favorite beeches restaurant , it turned out we had a party of twenty.. What a lovely surprise! This was the best thing that could of happened to us, as we always wanted to have a bit of a bash, and boy did we get it. We would just like to thank everyone who made this day so special for us, and it will remain a memory for ever. We had a lovely day, starting with a early morning bike ride around the lakes next to where we live, (at the moment,) and then onto our local gym for a sauna and a swim. 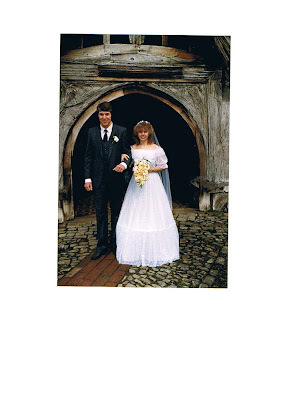 After something to eat we went on to the church we got married in. We were fortunate to find that it was open, and were able to go inside and reminisce the ceremony 25 years ago. It was such a nice thing to do as we had the time to look at everything inside, in great detail, and found out a bit more history about the church, which has been around since 1242. You don't get time for this on your wedding day, or any service for that matter. In the evening we went out for a meal to the old resturant we had our reception in (the Monte Carlo) This used to be a Italian resturant, but is now a Indian (aren't they all), but what a fantastic night we had. With plenty to drink and a live band we reminisced again all through the night. We now plan to reminisce the honeymoon!!!!!!!!! Special memories, so much laughter and fun, and a new adventure hopefully for the next 25 years. Well one out of the three boats at Fernwood is in the water. They are still working on the other two which should be out by April. The boat in the water looks just great and we bet that the owners will be over the moon with it. We should know more this week as we are making a visit to get an update, and we do feel that progress will move on quickly, very soon.